Using a professional to trim a tree or remove it is the safest method of removing a tree that is too big for your yard or damaged in some way. A Top Cut Tree Service will remove a tree even in close quarters to your home as shown in this picture. They climb the tree and remove one limb at a time, lowering each one to the ground for removal. It is then placed in a wood chipper, to be blown into a truck and carted away. Each branch is remove in this manner until all that is left is the main trunk of the tree. Even then the tree removal technician is strapped to the tree. He will remove a section of the trunk in four foot lengths until it is all down and he is standing on the ground. Even the large pieces of the main trunk of the tree are placed in the wood chipper. They are ground into small chips for later use as mulch and ground cover in someones garden. This particular tree was over 30 feet tall. It only took them approximately an hour to remove the entire tree and clean up all of the wood chips afterwords. Customers can also have the stump taken out by a machine that is a grinder. It is moved into place at the trunk. The stump is ground down below the surface of the earth to about 12 to 18 inches below the ground. Once covered up and re-soded, you would never know that there was a tree there in the first place. Safety for the technician, safety for your house and safety for anything immediately around the tree is a prime concern. Hard hats, safety climbing gear and safe processes are all used to ensure that the removal of the tree is completed without mishap. Many trees in urban areas are too close to homes and cannot easily be removed in the standard manner. The standard approach is cutting them down at the base and then chopping them up. Instead they must be removed one branch at a time. No damage to the home or surrounding plants occurs. 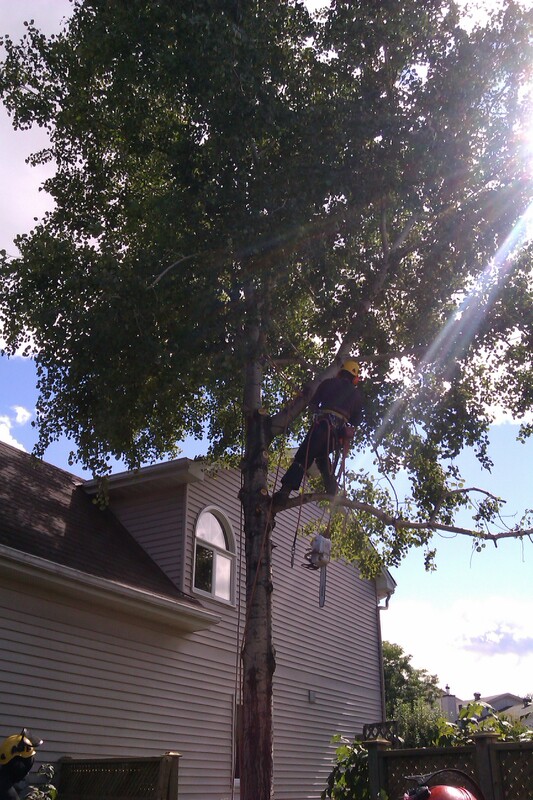 A good company can manage the removal of a tree with little or no damage to shrubs around or near the tree. They clean up after the tree has been removed. They remove all twigs and small branches along with leaves that may have fallen in the process. This is by far the easiest and safest approach to take regarding removal of a tree in urban areas. When the tree is very close to the house, do you generally leave the stump or take it out as well as the roots. Thanks in advance.